To celebrate Jack Kirby's birthday, the Hero Initiative has artists draw today and then will auction the artwork off later. 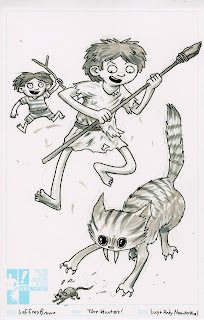 I drew Andy from my Lucy & Andy Neanderthal series, since book two - The Stone Cold Age - comes out tomorrow. And if you're in Chicago, you can come to the official release party at the Book Cellar tomorrow night (Tuesday August 29, at 6PM). *UPDATE* My piece is up for auction to benefit Hero Initiative now!